Building and scaling social presence is an interesting, but extremely daunting task, considering the dynamics of the social media industry. Thousands of photos, tweets, and posts are being posted every second online. To cut through the clutter and keep the buzz buzzing, social media managers are constantly learning how to approach different social networks strategically and tactically, through observations and tools. The truth is that companies can’t afford to ignore social media. Think for a minute whether Facebook users constituted a country, according to McKinsey, it would be the world’s third largest, behind China and India. Social media has become an opportunity juggernaut for businesses. Starting to explore open spaces, leaders realized that as long as their activities aren’t optimized for quality and efficiency on social, they lose connection with the market. What Do Social Media Management Apps Do? Why Use Social Media Marketing Tools for Business? Social media management is a combination of activities and roles responsible for creating, scheduling, evaluating, and engaging with content that flows to social media platforms. Reflecting on SMM, many think that the formula for being successful on social is creating compelling content. But every leader literate in social media knows that for a thumb to stop over a piece of content, it should be published at the right time and at the right place. At this point, ask yourself: What is the actual chemistry behind a contagious post? It probably tells a good story. It must be visually appealing. It is published during peak times when the readers are in their proactive mode. Wait. What does it take to seal these three points above completely into one beautiful origami envelope? This is where social media management tools step in. The best social media managing tools have databases with ready content and visual ideas and provide you with resources to design your posts to your taste. They also suggest peak times to schedule multiple types of social media content on different channels to get more engagement and increase inbound traffic. Put simply, social media apps consolidate all social management efforts under one roof and prioritize them for you. While it’s clear that social media tools facilitate work for social media managers, how exactly can they benefit different types of businesses? Social media marketing platforms analyze the trove of information and predict when it’s best to go on air with a new post for your brand. By knowing what works best and for whom, you can attract more people to your brand. They also prevent your staff from spending too much time on guesswork of when, where, and what to publish at a specific point in time. Social media managing apps facilitate collaboration between agencies and their clients by creating opportunities for fast approval workflow. There are hundreds of tools to help social media managers, but we’ve collected only the best ones to save your precious time. Below you’ll find the top social media management tools to harness social power, depending on what you’re looking for at the moment. 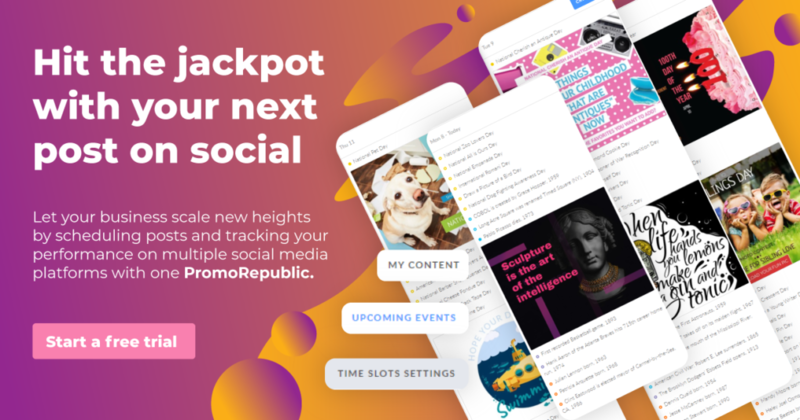 PromoRepublic is a one-stop social media management platform designed to facilitate SMM activities for agencies and their clients. It has a package of versatile features that allow users to create content, schedule posts, and track performance on social. What distinguishes PromoRepublic from other tools is a post ideas library with 6,000+ handcrafted templates, packed and ready to be published. In line with thousands of ready posts, the service suggests the best time to publish them for different industries following the insights of PromoRepublic’s built-in analytics. 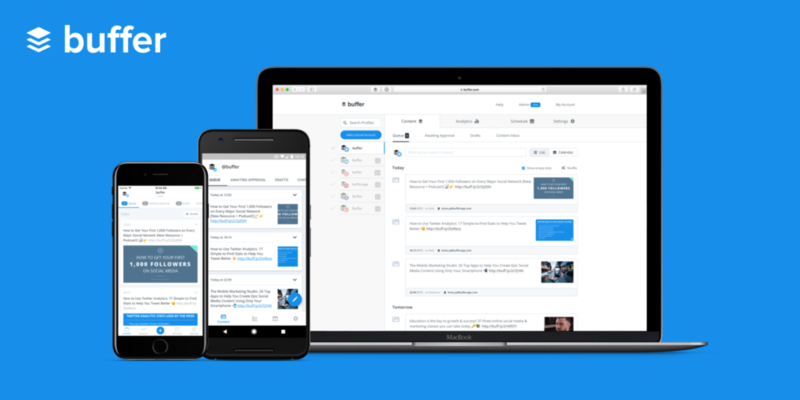 Buffer is an app for businesses and marketing teams to easily schedule posts, analyze up-and-coming performance, and manage all social media accounts in one place. Buffer also allows the team members to pile a queue of posts as they discover something on the web by means of its browser extensions and mobile apps. The tool is simple to use and claims to have very responsive customer support. 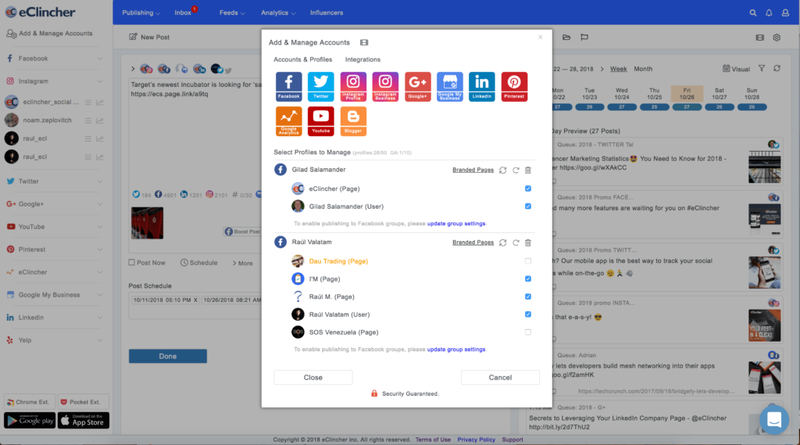 eClincher is a multifunctional social media management application that has many features, such as scheduling, publishing, auto-posting, engagement, and social analytics. Customers say that eClincher is easier to manage than Buffer and Hootsuite in terms of content scheduling and it replaces Sprout Social with better social inbox tools that allow users to store all followers’ interactions from multiple social media accounts under one roof. The tool also gives users the opportunity to assign tasks based on these interactions to other team members, encouraging collaboration between agency workers in a simple, yet efficient way. eClincher’s social media analytics includes data on follower trends, the success of posts, and peak times when the audience is online. Zoho Social is one of the best social media management tools in a class of its own thanks to user-friendly scheduling, posting, monitoring, and analytics features. The app allows businesses and agencies to manage multiple social media channels, schedule the unlimited number of posts, delegate work to the team, and track brand mentions. Zoho Social has a publishing calendar and a bulk scheduler, both clean and easy to navigate. Postcron is a social media management tool with auto post and bulk uploader functionalities that make it easier to publish up to 1000 posts, pins or tweets at once from an Excel or Google Docs file. 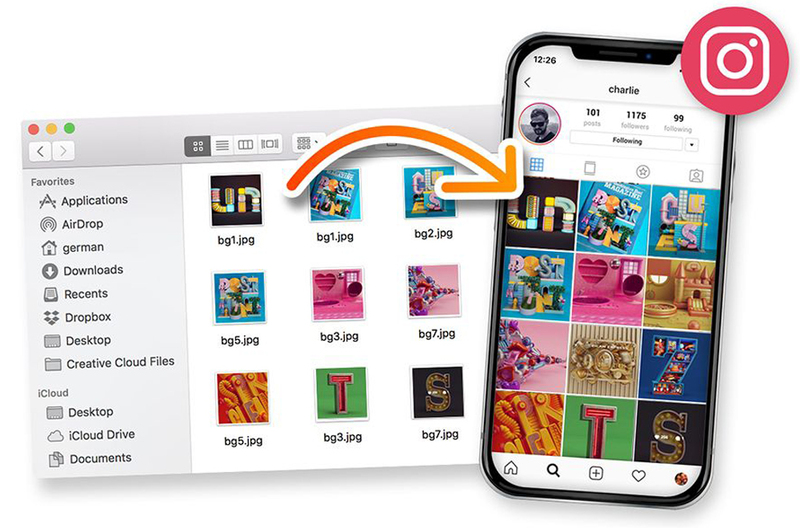 In addition to smart calendar features, it allows users to add their company logos or watermarks automatically on all their posts. The tool works with Facebook, Instagram (including video content), Twitter, LinkedIn, and Pinterest. Edgar is a social media tool that provides users with two ways of scheduling content – one-time posts and continuous scheduling, where Edgar keeps sharing the same content. What distinguishes it from other social media calendars is a smart composer, where Edgar writes your social media status updates for you, using natural language processing. Once your content gets its way to social networks, Edgar provides content performance analytics to keep your eye on how everything is going. HeyOrca is a social media calendar used by marketing agencies and their clients to consistently plan and approve social media content. It involves the clients in the approval process and thus makes social media activities more transparent and streamlined for success. HeyOrca has proven successful in reducing client review time by keeping every stakeholder on the same page. Viraltag supports all hype social media channels including Instagram, Pinterest, Facebook, Twitter, Tumblr, and Linkedin. The value it brings to customers is the built-in editor that allows users to edit visual content and publish multiple posts in one click. The beautiful post you created deserves to be shared more than once. Content Recycle feature is another outstanding function of Viraltag that automatically ‘recycles’ your top performing content to get more out of each post. Sprout Social is a toolkit for small and big enterprises to help them scale their social media efforts, designed to thrive in any environment. Sprout’s enterprise social media management platform unites large, cross-functional teams together to facilitate both content creation and distribution across different social media accounts, at the same time promising exceptional customer care and analytical insights. Hootsuite is a social media solution for the organizations of all sizes that helps with scheduling, monitoring, content curation, analytics, team management, security, and boosting. The app has the functionality of uploading and scheduling hundreds of messages at once. 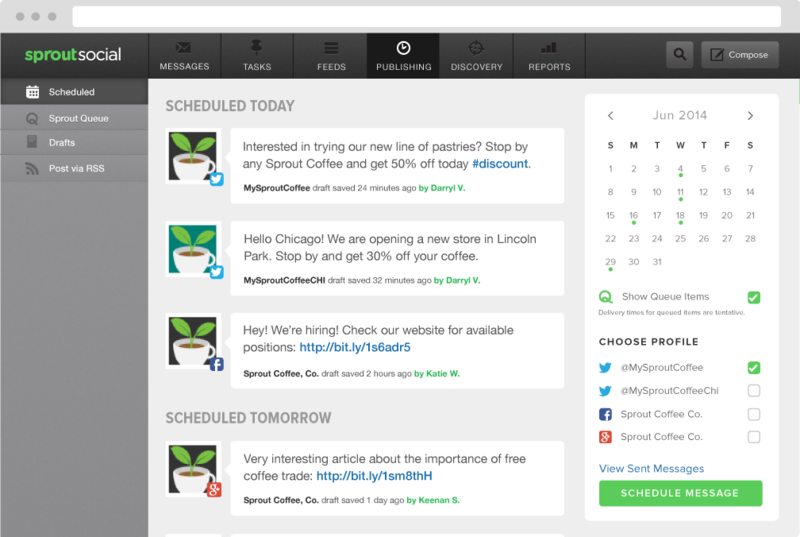 Similar to Buffer, you can use Hootsuite to schedule posts while surfing the web. Agorapulse is one of the easiest and most affordable social media management tools for large and small teams or agencies. Customers love Agorapulse for its report tab that unlocks insights and statistics broken down by audience, engagement, awareness, and management. As tools mentioned above, this app solves the problem of scheduling and publishing posts automatically, but it also provides users with useful weekly status updates. The beauty of Sendible, according to its clients, is that the tool helps create an award-winning social media strategy for agencies. It is a way to centralize all social media efforts for key networks like Facebook, Twitter, Instagram, and LinkedIn. In addition to putting an end to jumping between different social streams, Sendible is a way to create comprehensive social media reports for clients. Similar to eClincher, it emphasizes collaboration between co-workers and simplifies interaction with followers by showing areas badly in need of activity. 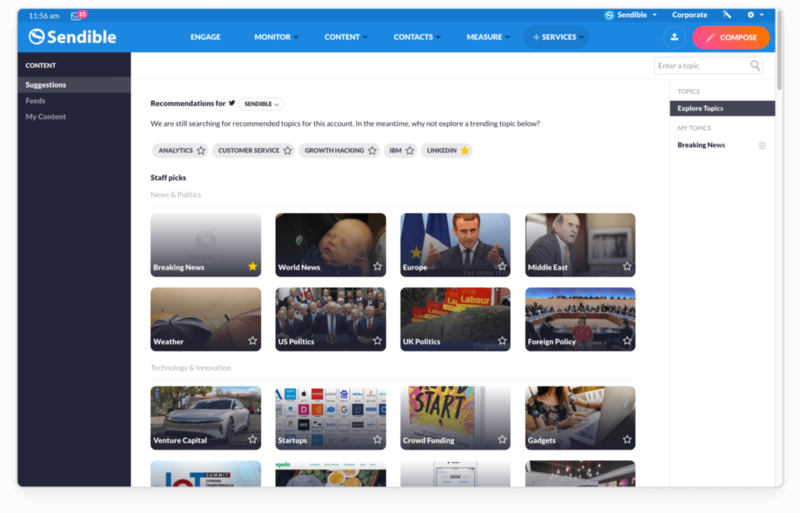 Sendible also has a unique content recommendation engine, suggesting the best content potent to get more shares and likes. This social media app has predesigned templates and over 250 charts to create social media reports that are easy to understand for clients. SocialPilot has a wide range of social media platforms to schedule, publish, and monitor content. It supports content distribution on Facebook, Instagram, Twitter, LinkedIn, Pinterest, Tumblr, and Vkontakte, at the same time providing analytics for a few. 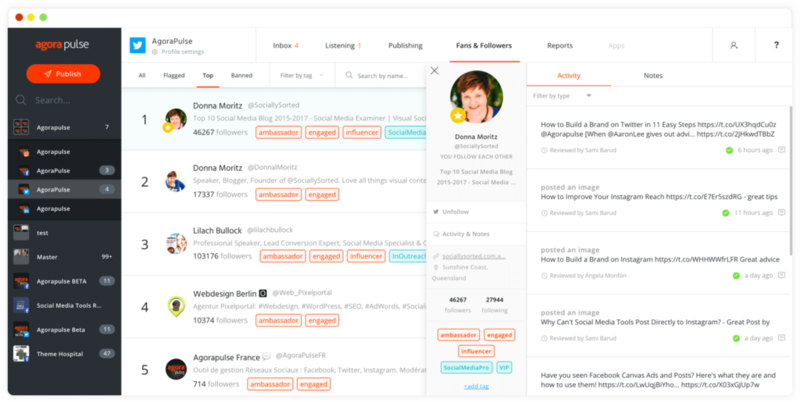 SocialPilot’s features include everything from scheduling to collaboration and content curation, but its main focus is on analytical insights with separate tools creating reports for Facebook, Twitter, Pinterest, and LinkedIn. Its portfolio of clients consists of agencies in the world’s leading companies, such as Amazon, Samsung, Gartner, Earsnt&Young, etc. 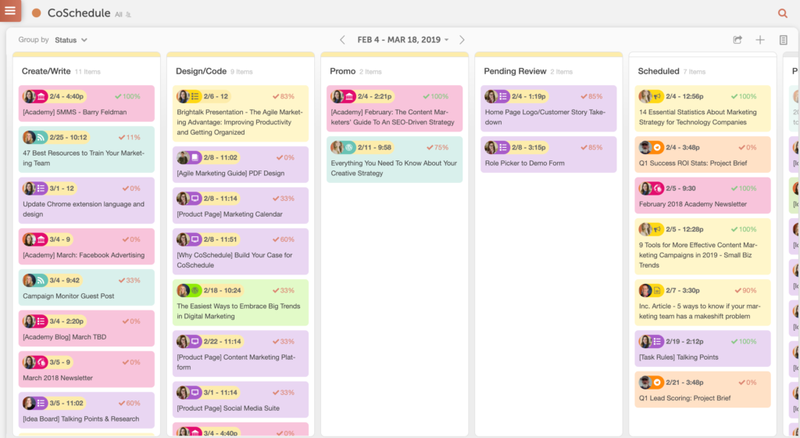 CoSchedule is a package of products for marketers, social media managers, content managers, and copywriters. Its Social Organizer is a quick and simple pivot designed to help users visualize the entire social strategy in one place. 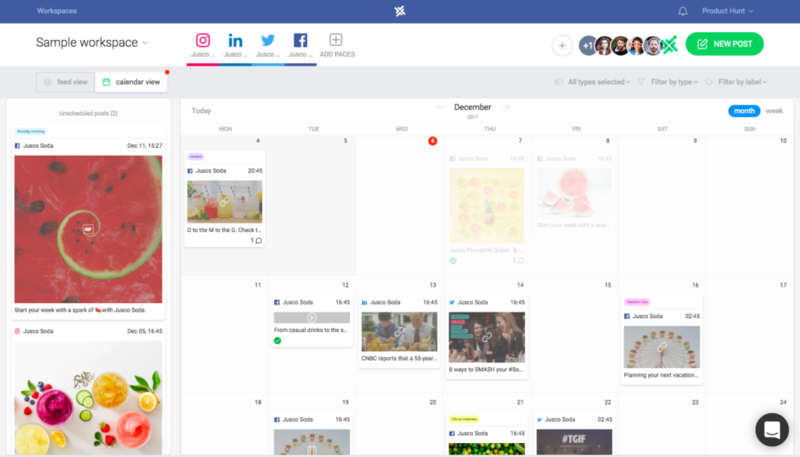 CoSchedule has a social media calendar, social campaigns feature, best time scheduling suggestions, social templates, social automation, and social analytics in its powerhouse. Crowdfire is a platform for managing social media accounts from one place. The concept behind this social media app is to help businesses reach the right demographics and link them with their targeted audiences on social. It is supposed to give users an overview of what’s happening that business owners need to know when social media is a priority. 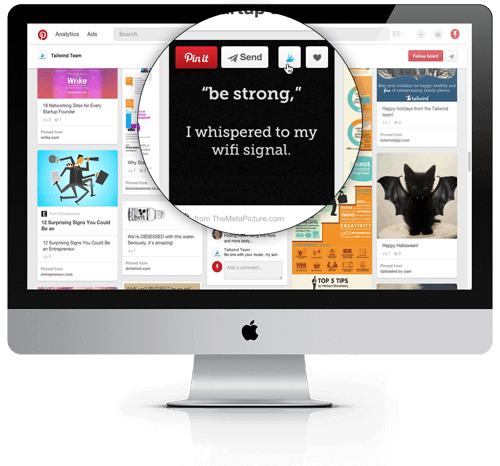 As the tools above, Crowdfire allows users to customize, pre-schedule, and publish posts with the audience in mind. In addition, it is a good platform to discover relevant content – what exactly your potential leads would like to see in their feeds. When social media management is concerned, Falcon.io is famous for building social listening queries to attract new relevant people to a product. Thanks to these, it’s possible to monitor brand reputation and find out how people treat your brand outside your social media pages. Falcon.io is a good fit for social media managers who seek to explore industry trends and related influencers. 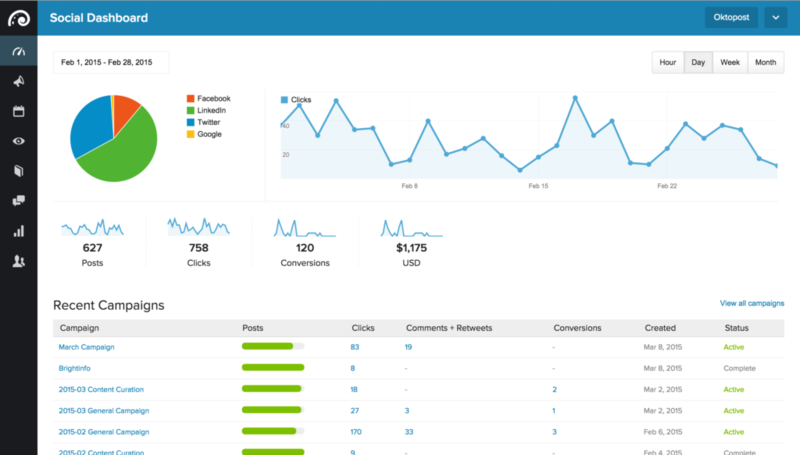 Statusbrew is an all-in-one social media tool that drives strategic decision making on social. It’s empowered by publishing, reporting, analytics, listening, and other features maximizing growth opportunities for marketing teams, small businesses, agencies, and enterprises. In addition to seamless content planning and publishing, Statusbrew offers monitoring of social media messages and allows users to respond from a unified single dashboard. Kontentino makes social media activities transparent among creative directors, brand managers, clients, designers, and translators. It organizes all posts in one place to get them ready for publishing, but before the content gets posted, the tool involves the client to approve the next steps. Kontentino provides the calendar overview of all posts ordered in a list that shows the status and can be easily managed. The tool allows users to do small graphics work, add translations for international clients, and store inspiration post ideas. 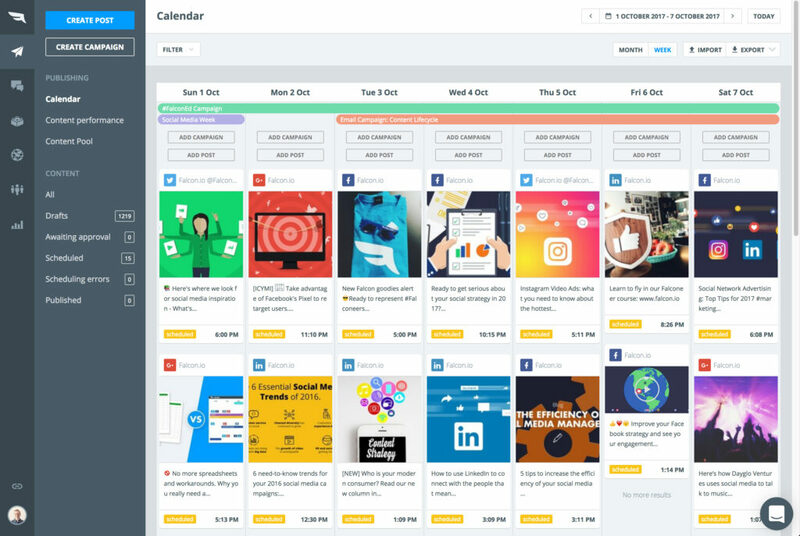 Loomly is another social media calendar with everything that marketing teams need to create content faster and distribute it on social. The tool suggests post ideas and reveals how to best optimize the publishing process. 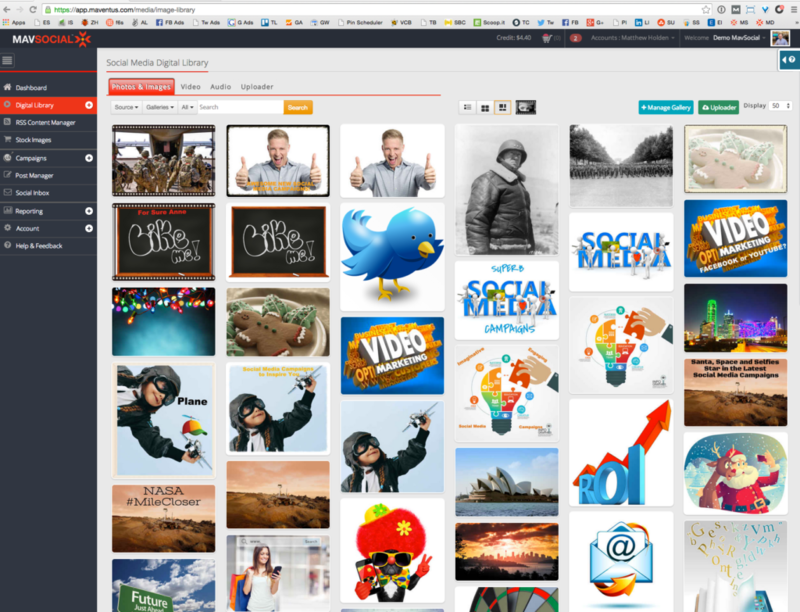 It allows teams to preview posts with auto-generated mock-ups and boost the most important ones. Additionally, Loomly has advanced analytics to track the performance of posts. All in all, this app’s mission is to make collaboration between individuals flawless and avert chaos when it comes to social media management. Oktopost helps B2B enterprises to manage, monitor, and measure all activities related to social media, thus enabling teams to reach their marketing goals. Oktopost is a powerhouse of three solutions on one platform that respectively involve social media management, social employee advocacy, and social media promotions. 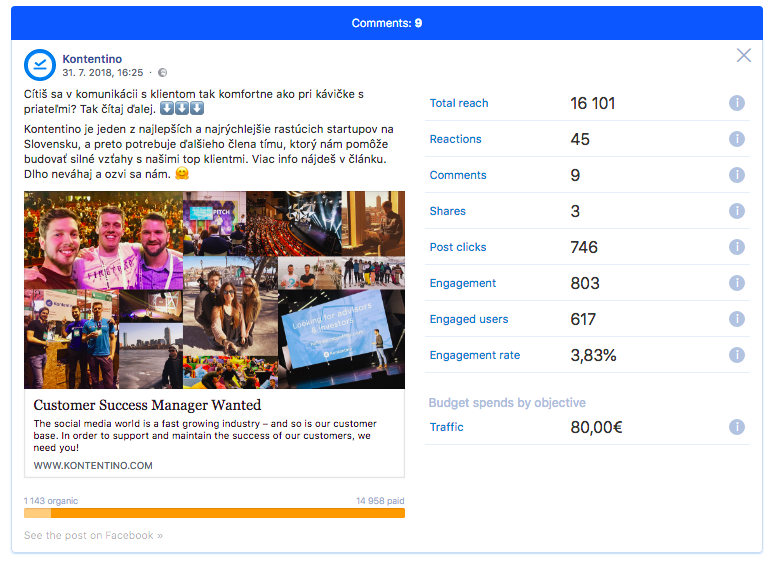 Social media management with Oktopost manifests itself in leading social campaigns, working with the editorial calendar, scheduling content at the most optimal times, and sharing the latest industry news from around the web. MavSocial has an array of social media features that include publishing, listening, engaging, reporting, collaborating, and curating content for enterprises. 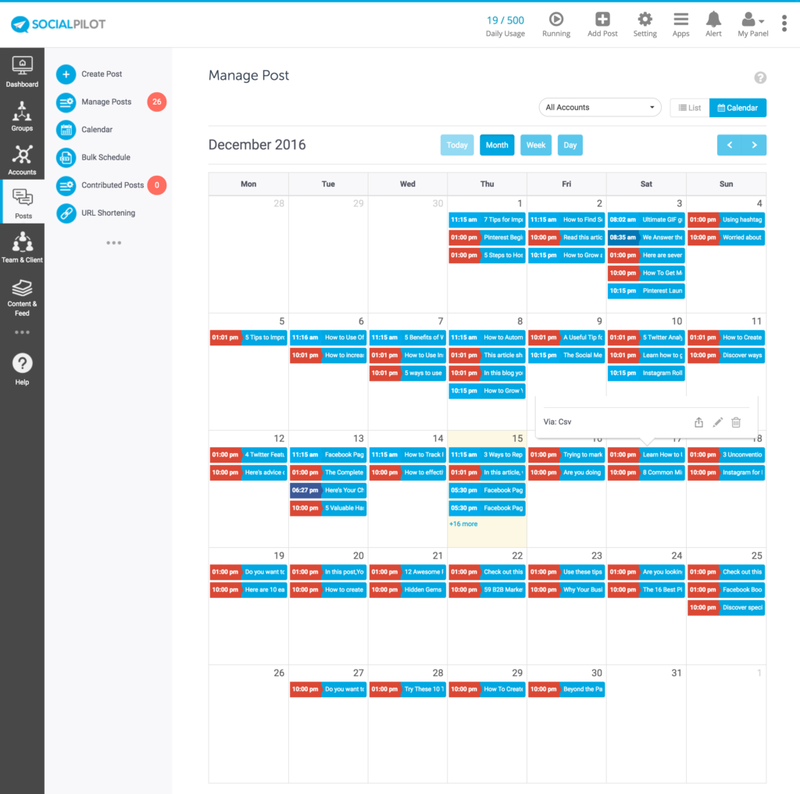 It simplifies social media management by helping experts schedule, automate, and boost posts using one platform for all. 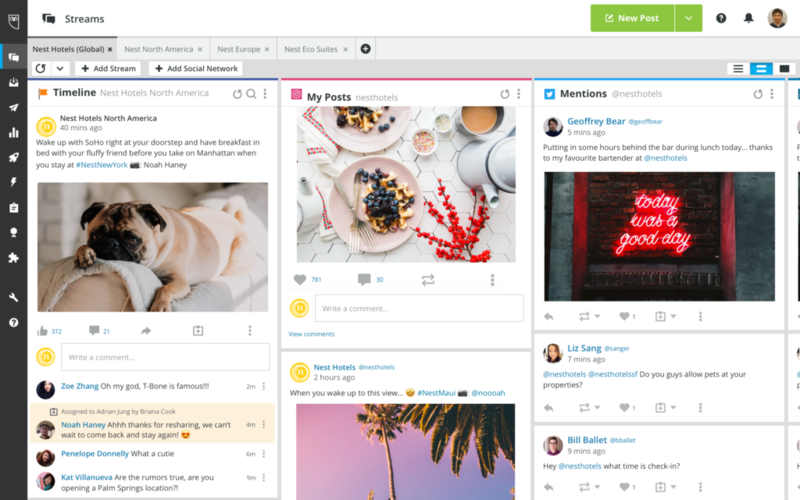 In contrast to other social media management tools, Tailwind was designed on the grounds of two social media channels, Pinterest and Instagram. It is especially good for bloggers, but also applicable to businesses of all sizes, and extensible for enterprises. 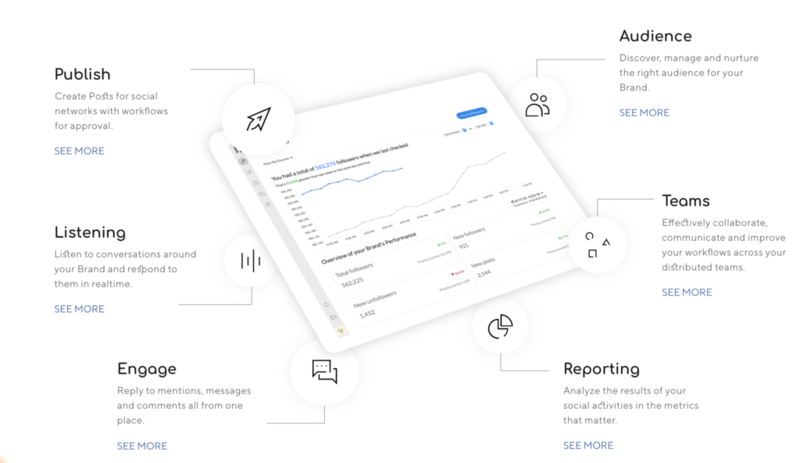 Tailwind promises to help users schedule posts, discover content, monitor conversations, amplify reach, and measure results on Instagram and Pinterest landscape. It provides suggestions for how to improve a Pinterest account. 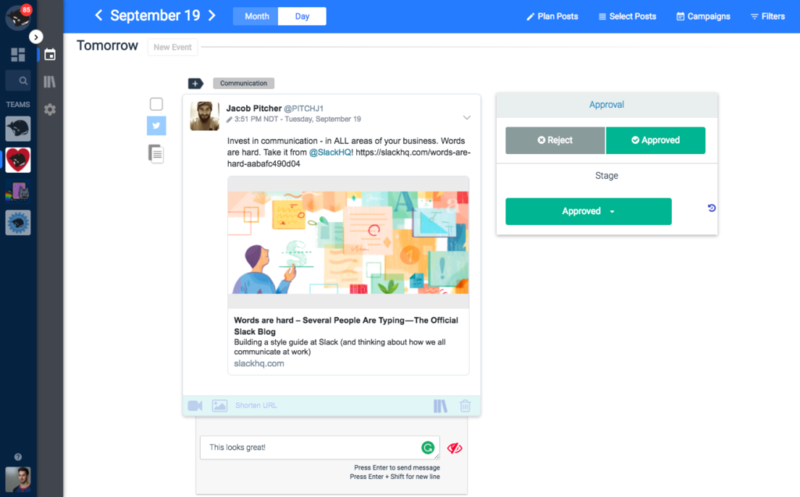 Planable is another tool designed to help social media marketers plan and preview Facebook, Twitter, and Instagram content exactly as it’s going to appear when published. An additional favorable side of Planable is that the tool simplifies feedback process between teams and their clients serving as a place where all discussions can be held and unnecessary clutter minimized. Now that you have a list of social media management tools right in front of you, check out these social media analytics tools and share your feedback with us. Which one do you love the most and why? What features would you like to see improved?